Some unexpected but welcome Jelly Bean updates making news this morning as the LG Optimus L9 and Samsung Galaxy S Relay 4G are receiving Android 4.1.2. The standard fare of Jelly Bean enhancements are onboard, most notable of course being the inclusion of Google Now and a revamped notification system. Both updates begin today, April 22nd and in the case of the LG Optimus L9 is an Over-The-Air update only. 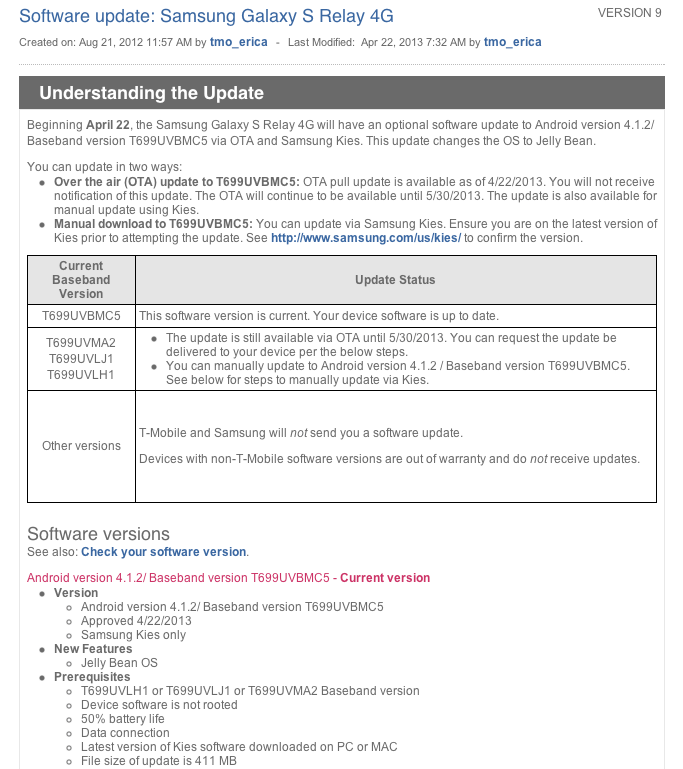 The Samsung Galaxy S Relay 4G can get the Android 4.1.2 via OTA update or by using Samsung’s Kies desktop software. The update for the L9 clocks in at around 350MB, with the Relay 4G punching in around 411MB so you might want to give these a go on Wi-Fi or rock that unlimited plan. Let’s hope the HTC One S Jelly Bean update arrives in the not-so-distant future as all these “lesser” phones receiving updates is a punch below the belt for owners. Come on T-Mobile/HTC, show One S owners the Jelly Bean goods. Why not the G2X GOSH! lol..gave up hope sometime late last year after they released it for the o2x. warranty’s probably nearing its end, so maybe it’s time to just go custom rom..cm10, anyone? So uhh, I’ve already ordered the HTC One but where in the hell is the One S’ update? This is pathetic. that is the main reason I wont buy the HTC one cause HTC doesn’t support their phones. The relay has already been discontinued and its still gets a update. I’m still waiting for a Jelly Bean update for my Galaxy S Blaze! So true, a punch below the belt, especially to original Galaxy Note owners. meanwhile HTC One S owners look to the skies lol … it’s the reason why i can’t go HTC again .. their updates have become considerably worse with each device. i’m sure it’s more than likely both. 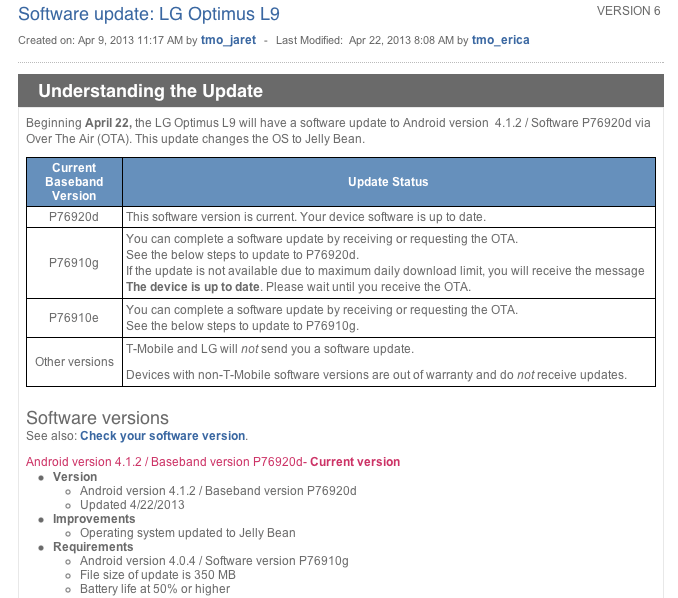 i have the the optimus L9 on the prepaid plan, will i get the update, also or is it just the postpaid plan holders? You should get the update since this is dependent on the phone and not what kind of plan you have. Thanks..wasnt sure if the prepaid would be supported or not..thanks! it doesn’t matter what plan are you on. as long as it is a t-mo variant, you should get it. I don’t have enough storage available for the update time to clean out the phone. Also would be nice to see the Amaze updated to JB. It was released alongside the GS2, which now has JB. The issue here seems to be T-Mobile. The Jellybean update was released a few months back for the European One S and look at what US customers have gotten – nothing. I don’t know what the holdup is for T-Mobile and HTC but something seems to be awry. I love my HTC One and I’m using it as my daily, but I’m not getting rid of my Nexus anytime soon. So cool and totally unexpected. I bought it for $250 and never expected it to get updated. sooooooooo Where is Galaxy S III 4.2/Premuim sweat upgrade T-Mobile ????? Is that even available on the unlocked version yet? I’m guessing you meant 4.1. There’s no 4.2 update for the GS3 yet. Correction i meant 4.1.2/ Jelly Bean – Premium Sweet Upgrade. Sprint got theirs today. So now were waiting like the AT&T folks. I swear, it must be a sort of tactic to delay updates for higher profile phones. I have the One S – “The one phone you will ever need to own…” Well, I need Google Now and other Jelly Bean goodies. Anyone recall when Bill Gates said a 10 MB hard drive is all you will ever need? CyanogenMod 10 has graced my One S for the last month, and I have to say I am quite pleased… only wish Maps would quit crashing; it makes navigation near impossible. Looking forward to going back to something fully functional if T-Mobile and HTC get off their high horse and make this update happen. Love the Bill Gates reference. In 1943 the president of IBM said he thought there would only be a world market for maybe 5 computers. Underestimating the impact of technology on our future is absurd. YES YES YES!!!! I have an L9 and have been waiting for this forever! I tried over Wi-Fi and over 4G and my Optimus L9 just says “Already up to date.” Meanwhile the Android version shows as 4.0.4. Has anyone successfully gotten an upgrade yet today, or does it not really roll out until later in the week? Next couple of day’s i am fine with that. Did yours update? I’m still waiting. Still waiting too. Im sure there’s a lot of us who have this on Tmobile prepaid as its there best device they sell for it directly currently.. Hopefully well get it soon. I was starting to think they weren’t updating the l9 at all. So now of course am anxious for it. Thanks. yea i am still waiting i think it will happen soon. I think the lg l9 is a great device for 199.99$ and now getting update on it. Well said. Ya it is good I think it’s the longest Android device ill be sticking with a while. I esp like how they packed a good size screen in a slim size. Kind of like Motorola does with there Razr’s. The camera is pretty good etc too. People used to say that about Samsung’s Android phones and updates. Sweet…I just bought a Relay (8 days ago) to replace my wife’s Mytouch 4G Slide (cracked screen). I thought it was an orphaned device. The store told me that they only keep very limited stock of them on hand (I bought their last one) now and that stock is determined on the corporate side, not by the store. My mother in law’s LG L9 crapped out over the weekend. Nothing can be done to get it turned on, regardless of the chargers. Not sure if it as defective battery of something else going on in the system. Anyone’s l9 get an update yet.? Still waiting here – tried just after midnight EST, and again around 9am EST just in case there’s some kind of First Come, First Served line per day. Still waiting too. Im sure theres a lot of us who have this on Tmobile prepaid as its there best device they sell for it directly currently.. Hopefully well get it soon. I was starting to think they weren’t updating the l9 at all. So now of course am anxious for it. Here’s what i did to update my lg optimus l9 to jellybean. I went to my setting+apps+all+google framework+cleared+forcestop, make sure all numbers are 0. Went back to settings went to update and it said last update 12/31/1969 dont get alarmed press update and viola it updated. Done at 6:15am on 04/28/13. Had to try several times. Also If it doesn’t update from there, try this use all the steps above except for the last one which was, pressing update. Power down your phone, power up again then go back to setting then press update and it should work. Hope this helps everyone because it worked for me! Thanks!! It sure did help. I got tired of waiting. So I did this today. I saw your post on another Android site & I thought what the heck & like you said voila it updated. How did you figure this out?. I received my update yesterday. Particularly strange; the Relay just got the Jelly Bean update… and they EOL’d (End-of-Life) the Relay in stores. We aren’t getting any more, and we have to send back the ones we have. As a T-Mobile employee who owns a Relay, this is weird. Especially with so many older phones (Galaxy II?) that haven’t been EOL’d yet…. What, no Galaxy S Blaze 4G? Still waiting for the update……. This “update” has been a complete and total botch job. Has anyone ever successfully used the LG Update Tool? I get as far as “checking phone number” and then it says it can’t connect to server. I’ve modified my hosts file but I don’t think I have the right IP. Anyone know if 183.83.187.5 is current? I’ve tried to ftp, http, ping, and tracert with no success on any. Anyone know the LG update server IP? On there LG l9.? I still haven’t received mine yet.!!! I just checked at 11AM Thursday on the east coast. Nothing yet … I have a feeling this update for the Optimus L9 hasn’t truly been released yet since no one seems to have actually downloaded it. Yea I think they really weren’t ready when they announced it Monday. I am going to call customer services tomorrow. One s owners are already downloading there update that was announced today. Let me know what they say. I still don’t have it!.. They said it will be anyday now. I finally got my L9 updated using the same method after about 15 attempts (clear and force stop Google Services Framework, then Check For Updates … I repeated these two steps over and over again until it finally found the JB update). Weird…My L9 STILL hasn’t updated to jellybean? If you are still waiting too, pls reply to this. Thanks. Also, to those of you who have upgraded it, what is it like? What new features have they added? No one has received there update yet.and T-Mobile’s hasn’t said why the update is taken so long. I’ve got the one s update yesterday.. it’s 4.1.1 not 4.1.2 though.. I have 3 optimus l9’s in the family though, and none of them got their update yet. I think I figured it out. I tried forcing the OTA as others have mentioned by the clearing and stopping the Google Services Framework and then checking for the update (Google search “force android ota”). I did this numerous times mostly late night and early AM but it did not work. I tried doing other things such as changing settings to allow installation of unknown app sources, enabling USB debugging, removing the SIM and SD cards, restarting, etc. I finally got it to work this afternoon. I thought it was the USB debugging mode as that was the last change I made before it started working on mine but when I tried it on my wife’s phone, it did not work. I remembered what I did differently. I stopped and cleared the Google Services Framework and then went to the update page but I did NOT tap on the check for update button. As I got distracted, I left the phone on my couch while still on that update page which showed the last time it checked for updates was 12/31/1969. I then went back to the phone after a few minutes and pressed to power button to turn the screen back on and it was automatically downloading (I had left wifi and data on). I just did this to my wife’s phone (also an L9) and after about 20 minutes, it started downloaded and is updating as I am posting this. Thank you. Android 4.1 is awesome. Hi.. Here’s what i did to update my lg optimus l9 to jellybean. I went to my setting+apps+all+google framework+cleared+forcestop, make sure all numbers are 0. Went back to settings went to update and it said last update 12/31/1969 dont get alarmed press update and viola it updated. Done at 6:15am on 04/28/13. Had to try several times. Also If it doesn’t update from there, try this use all the steps above except for the last one which was, pressing update. Power down your phone, power up again then go back to setting then press update and it should work. Hope this helps everyone because it worked for me! The Google framework method. It will only update on Wi-Fi. It is definitely worth updating so many new features. holy grapes it works i got the update thanks guys beer on me.